It is slowly becoming evident that today’s extractivism is advancing in a context of increasing violence. The advance of extractivism through industries such as open air mining megaprojects, oil exploration in the Amazon, or single crop cultivation, has had enormous social, economic, territorial and environmental impacts. It is slowly becoming evident that today’s extractivism [economy based upon the extraction and export of natural resources such as oil, gas and minerals] is advancing in a context of increasing violence. This is not an exaggeration: distinct forms of violence are being employed to impose and protect extractivism, a situation in which popular mobilization also and ever more frequently finds itself entrapped. This outcome should not be surprising. We know that the advance of extractivism through industries such as open air mining megaprojects, oil exploration in the Amazon, or single crop cultivation, has had enormous social, economic, territorial and environmental impacts. These effects are of such a large scale that many local communities are opposing this type of exploitation of natural resources, which in turn obliges the promoters of these industries, be they corporations or governments, to use even more pressure to be able to impose them. In some cases, the result is low level, albeit persistent, violence, be it through the silencing of popular leaders, launching campaigns to discredit social groups, or criminalizing their mobilizations. In other cases, the levels of violence reach a greater intensity. This occurs when extractivism’s promoters call upon the police or the military to squash popular mobilization, leaving behind a trail of injury and death. 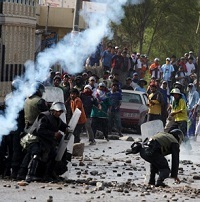 One of the most conspicuous examples is in Perú, where under the government of Ollanta Humala, 60 people have already died in social conflicts (the three most recent stemming from protests against the Tía María mining project, which led to the declaration of a state of siege in that region in May 2015). In other cases, hired assassins are employed to kill local leaders, as has occurred in Colombia and Brazil. These types of cases are well known in almost all Latin American countries. But other more complex and largely paradoxical situations are being added in. Because many of those involved, such as analysts, businesspeople, and especially governments, have insisted so greatly upon spreading the myth of extractivism as a source of enormous economic wealth and well-being, there are so many sectors who have come to believe it. Among the convinced are those who have abandoned their rural practices to devote themselves to mining, communities which have made pacts with oil companies, or farming families who have gone into debt to buy the new soy technology. Some of them have managed to increase their incomes in times of high prices for raw materials. But that has also led to foment another type of violence, in which some groups confront other ones, for example, for access to a mining site. In this way, very complicated situations are created, wherein community members fight each other, the ones who want more mining against those who reject it, or miners who invade sites of other miners. And then, in addition to all of this, are actions by the police or private security forces connected to the corporations. Emblematic examples include the terrible confrontations between local groups surrounding the Mallku Khota mine, or the fighting over control of the Arcopongo gold deposits, both in Bolivia. As if this were not enough, more processes continue to be added in. The fall in the prices of raw materials has caused many to wake from their economic fantasies, and as the shadow of poverty returns, some of them have taken their protests to the streets to mobilize and demand that governments compensate them in some way as global markets tumble. They are demanding the promises of wealth and well-being that were made to them, and sometimes they resort to violence. Governments, in turn, react as they almost always have done, also responding violently in their own fashion. 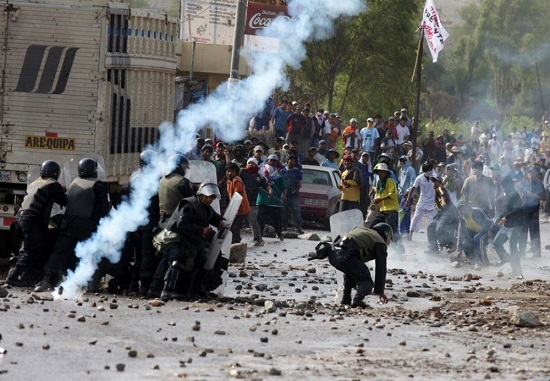 That is what is happening right now in Bolivia, with the mobilization of citizens’ groups and mining cooperativists coming out of Potosí to the city of La Paz, and resulting in various skirmishes with the police. It occurred recently in Perú, with the mobilizations of informal or illegal Amazonian gold miners. In each situation, we are faced with something like a peoples’ extractivism, demanding that the government either increase extractivism or give direct financial compensation. All of these situations demonstrate, in different ways, how extractivism produces and exacerbates violence. The State has repeatedly used extractivism to impose projects that, if the requisite environmental analyses had been seriously carried out, or the public consulted, or the real economic costs been calculated, would never have been approved. There are communities which have resisted this push as best as they could, have suffered violence, and live a daily existence of violence-ridden “policies.” Because of these, they have also resorted to violence, perhaps because they have been cornered, or because those are the sort of policies that they have seen for decades. To the degree that more people now want more extractivism, the impetus to violence has become more powerful. The primary responsible party in the face of these situations is not social movements but the State. The State, however, has insisted upon presenting extractivism as a safe form of economic growth and poverty reduction, its activities having minor impacts and sure benefits, and scorning those who raise their voices in alarm. The State has sown extractivism, and has done it intensively and for many years, repeatedly resorting to violence. And because of that it now reaps violence, either its own, due to its limitations in terms of such issues as the guarantee of human rights or the reprehensible deployment of its own as well as others’ security forces, or the violence of others, either to oppose extractivism or desire it all the more. All of which makes clear that present day extractivism is inseparable from these violent dynamics. There is no such thing as neutral or inoffensive extractivism. These are projects immersed in either a diffuse or extremely focused violence, such as from the harassment of NGOs to, at other times, displays of all the force with which the police or military are imbued. Violence is always present in one way or another, ending up affecting above all the weakest, the local communities, especially campesino small farmers and indigenous groups. There is no reason to disguise these links; on the contrary, recognizing this close relationship is indispensible in order to think of any alternative. Dismantling this spiral of violence is only possible with the initiation of a serious process of transitioning out of dependency upon extractivism. 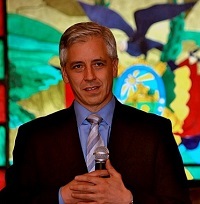 Eduardo Gudynas, one of Latin America’s most respected environmental analysts and activists, is a chief researcher at the Latin American Center for Social Ecology (CLAES). Danica Jorden is a writer and translator of Spanish, French, Portuguese and Italian.